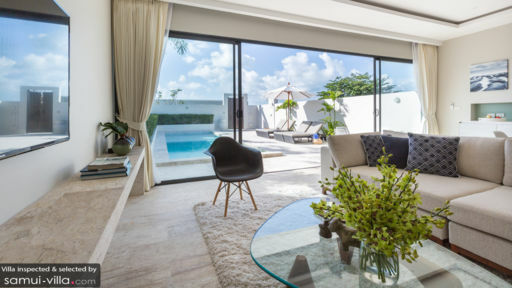 Found on the shores of Plai Laem beach near the famous Big Buddha in Koh Samui, Villa Saam at Skye Beach Villas is one of four properties that line the coast with their elegant white exterior. 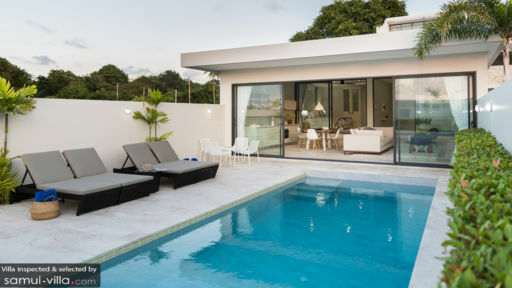 The villa is a two-bedroom property that can be rented out alongside the three remaining villas for an eight-bedroom retreat. 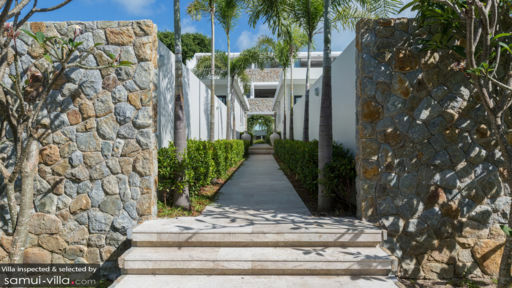 Perfect for couples and families, the villas are well-furnished, modern, and conveniently located. The glorious sunsets are many and abundant, the beach is at your doorstep, and you have a private swimming pool to wade in. As you make your way well into the living area, you will be greeted two glass walled-bedrooms. The glass doors slide open to reveal a heavenly abode with king-sized beds laced with monochromatic bed runners. The linen is the highest quality with a thread-count that will instantly put you to sleep. With air-conditioning, you have nothing to worry about as the nights are cool. The minimalistic décor keeps the room cool and refreshing with a touch of the outdoors as seen through the windows. Ensuite bathrooms accompany each bedroom with showers and other amenities. As soon as you enter through the antique wooden doors, the refreshing sight of the villa swimming pool will greet you. Bordered by a stone sun deck, the pool is where many hours are spent idling away under the open skies. As the sky changes colours from halcyon blue to mauve, you can rest on the sun chairs and take a moment to appreciate the serene ambiance. The outdoor shower is right at the entrance so you can climb in the pool squeaky clean. You have a four-seater, outdoor dining area for tea or breakfast as you bask under the tropical sun. The indoors are awash with sunlight and constant fresh air thanks to the sliding glass doors set in a black frame. The aesthetic is mostly contemporary with minimal décor and subtle hints of colour. Inspired by the sand and the sea, the beiges and white are complemented by blue hues. Lounge on the plush sofa and watch your favourite shows on the Smart TV, read a good book, or simply spend time hanging out with loved ones. The room is air-conditioned if you wish to keep it cool. A round table with a wooden top is part of the dining area with seating for enough guests that you can enjoy family meals. The overhead spotlight illuminates this area specifically to drown out all other aspects of the living area keeping just the purple-hued evening sky in focus. Right beside the dining area, you have the fully-equipped, modern, and state of the at kitchen with in-built modern appliances, white counters, and a glass splashback. Villa Saam is part of the Skye Beach Villas estate that promises excellent and five-star amenities to its guests. There is so much to see thus, everything from housekeeping to other daily chores are looked after by the competent staff members. There is a villa chef who is highly-trained and will delight you all sorts of cuisines (upon request). The location could not have been more idyllic thanks to splendid panoramas that sweep across the ocean. Nearby, you have popular spots such as the Big Buddha, Bophut, and Fisherman’s Village. Head outdoors for some fun water activities, surfing, and exploring town.